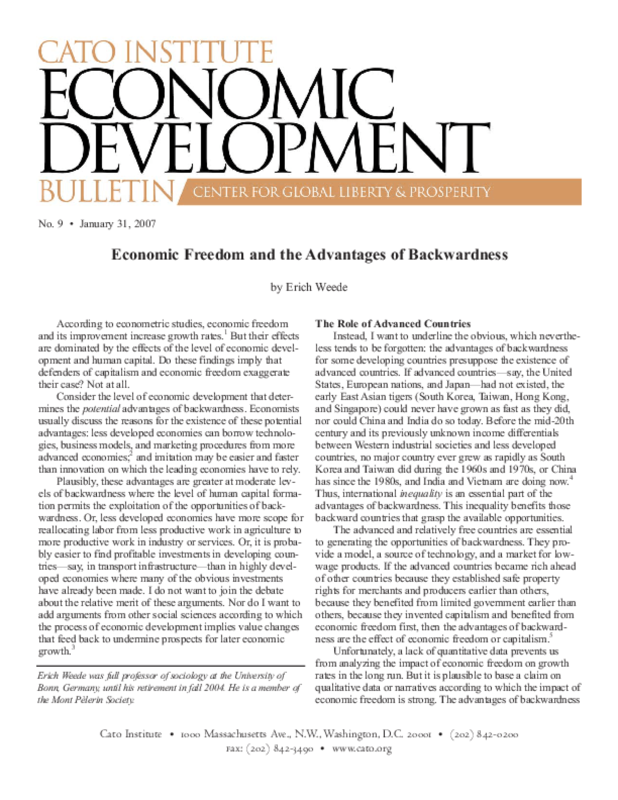 According to econometric studies, economic freedom and its improvement increase growth rates. But their effects are dominated by the effects of the level of economic development and human capital. Do these findings imply that defenders of capitalism and economic freedom exaggerate their case? Not at all. Consider the level of economic development that determines the potential advantages of backwardness. Economists usually discuss the reasons for the existence of these potential advantages: less developed economies can borrow technologies, business models, and marketing procedures from more advanced economies; and imitation may be easier and faster than innovation on which the leading economies have to rely. Plausibly, these advantages are greater at moderate levels of backwardness where the level of human capital formation permits the exploitation of the opportunities of backwardness. Or, less developed economies have more scope for reallocating labor from less productive work in agriculture to more productive work in industry or services. Or, it is probably easier to find profitable investments in developing countries -- say, in transport infrastructure -- than in highly developed economies where many of the obvious investments have already been made. I do not want to join the debate about the relative merit of these arguments. Nor do I want to add arguments from other social sciences according to which the process of economic development implies value changes that feed back to undermine prospects for later economic growth. Copyright 2007 The Cato Institute. All rights reserved.